I’ve been playing a lot of incomplete and glitchy games lately, from Radical Heights to Far Cry 2. Their messy imperfections often annoy players looking for sleek and polished experiences where everything runs smoothly but I find unfinished textures and falling out of bounds is strangely beautiful. 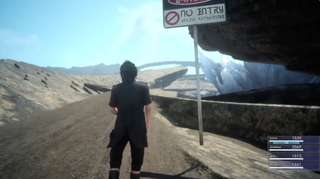 When Final Fantasy XV’s demo Episode Duscae released in June 2015, it didn’t take players long to find hidden places in the world where they weren’t meant to go. Using cars to knock them beyond seemingly impassable barriers, players were able to sneak further into the center of the map. I was one of the players exploring those hidden depths. The game world begins to fracture as you get closer to the middle of the map, textures failing to load and seemingly solid ground losing collision. If you follows the right path, you can walk right up to the giant Astral being Titan who holds up a meteor above the ground. His character model is hardly textured, his skin a blur of ill defined brown. Seeing Titan early felt special. It was intimate and personal, a moment where the illusion broke down and I saw the game for what it was: a collection of assets and fragile code. Early access and beta testing makes these imperfections readily apparent and the result are wonderful, half-formed worlds. Radical Heights, which is in ‘X-treme Early Access,” isn’t necessarily fun to play yet but it is fascinating to explore. The battle royale takes place in an incomplete and broken world where grey-box houses have immaculately green front yards and where stairs are visible but don’t always work. There’s a roughness and unpredictability that, love it or hate, is still interesting. This holds true for PlayerUnknown’s Battlegrounds newest map, Savage, which is currently playable on a closed experimental server. It’s a hodge-podge of finished and unfinished assets and I love how messy it is. Look at this gazebo. Look at this hard edged and textureless piece of game design. When the map officially releases, that version the gazebo will be replaced with something detailed and believable but I’ll always remember this one. It reminds me of the people making the game, of the artists and coders and model makers. Seeing it connects me to the creative process that makes PUBG possible to begin with. The same is true for Radical Heights; wandering the grey-box neighborhoods feels like I’m seeing some sort of secret that will eventually get painted over and forgotten. Games present fictional worlds for us to experience and we accept them as real so long as their rules are consistent and the space detailed enough. Skyrim is a fantasy world with elves and dragons but players treat it as something of a real place with lush forests and gravity that makes their arrows arc. But Skyrim is also notoriously glitchy and broken. Framerate dips, questlines break, and it’s possible to shatter the world’s economy selling potions worth 9,999,999 gold. When we start playing a game like Skyrim, a sort of invisible contract is formed where we agree to buy into the world’s fiction so long as that world remains stable. Glitches threaten to interrupt the act of play or even undo hours of progress. They shatter our suspension of disbelief. Sometimes it can be funny, in other times it breaks the contract irreparably. For me, watching Skyrim break and getting to go behind the curtain is one of the only things I like about the game. There’s this chest in Whiterun that you can’t normally access because it’s actually beneath the ground. To reach it, you need to climb a barrel, scale the city walls, and go “outside” into a half loaded version of the overworld. From there, you can clip through the ground and reach the chest. As it turns out, this chest is there for a reason. 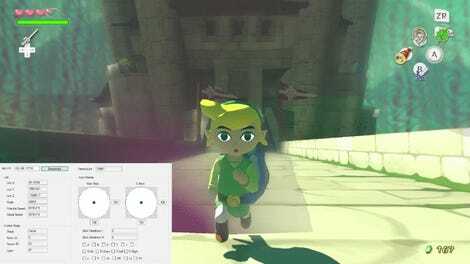 It’s actually where a blacksmith’s inventory is held. Opening the chest allows the player to take anything from his shop without paying. I love this chest because it’s one of the few “real” things in Skyrim. We often only see what games want us to see but this chest reveals something about how the game actually works. When I see that chest, I understand the game a little bit more. I want to encounter Missingno and I want speedrunners to be able to warp right to Ganon’s Castle. When games glitch, they share a piece of themselves with us. A super polished game is nice but I live for the moments where games break.